The term spice contains an endless number of plant-derived ingredients used in the cuisine to refine foods. All parts of the spice plants from seeds, flowers, leaves, barks to rhizome or roots can be used for refinement of foods. In this overview, also celery, sesame and mustard which belong to the category spices, will be briefly touched too, even if detailed descriptions can be found in separate sections. Names, synonyms and biological classification of the most popular spices are given in Table 1. Few spices are added raw to the dish. Many of them are used in dried or freeze-dried condition, as dill, parsley or celery, which then contain most of the allergic proteins also present in the raw spice. Allergens in pickled spices are unchanged or better conserved than in the dried ones, e.g. in the case of green versus black pepper. Additionally, mechanical grinding of the dried material may destroy some allergens, e.g. in the case of paprika, but still leave a considerable number of allergenic proteins. Roasted spices may keep their potential for allergenicity, as poppy seeds or sesame, the latter often consumed toasted on bread. Spice allergens can, therefore, be expected in raw, toasted, grilled, baked, cooked, tinned, pickled or dried food when eating out or at home, in freshly prepared or fast food. Spices may produce mild symptoms: itching, swelling, burning at lips, tongue and palate or severe local reactions in and around the mouth: swelling of the throat, flush, breathing problems, stomach indigestion, vomiting, diarrhoea, and systemic reactions such as hayfever, asthma and anaphylactic shock. For most spices, the current scientific evidence is unsatisfactory to establish an intake threshold. However, for the spices taken up into the food allergen list of the EU (see below) some data on lowest reactive threshold are available since recently: for dried celery spice 160 mg, sesame 30 mg, and mustard 40 mg. Below, allergic reactions did not occur in the tested patients. It may be considered that thresholds for other spices may be comparably low and, consequently, low-dose challenge trials are recommended. In most cases of reported spice allergy, IgE-cross reactions with pollen were reported. Especially birch pollen, and mugwort pollen allergy represents a risk for the development of reactivity to spices. Cross-reactivity to latex has been reported, too. The elicitors are plant proteins that are similar in different plants. Common reactivity is more likely in plants that are botanically closer related (Table 2). Who, when, how long, and how often? Spice allergy represents 2% of all food allergy cases. It is rare in children and more prominent in adults. Allergic reactions can be seen as occupational allergy in spice factory workers. Besides allergic reactions also contact eczema may occur. No data are available today on the outgrowth of spice allergy. For yet unknown reasons women have a double risk to develop food allergies including spices. Spices are often hidden in the prepared food and not obvious to the consumer. Therefore, a careful recollection of the allergic reactions is the first important step for the diagnosis of this type of allergies. The safest and least invasive procedure for the patient is blood samples, On the other hand, spices may produce false positive results in skin prick or scratch tests through their contents of irritating substances (in particular in pepper, and cayenne.). (For the same reasons skin tests for diagnosis of allergic contact eczema due to spices, may not be sufficiently reliable). Thus, ideally skin tests should be combined with blood samples. Challenges represent a useful tool for the evaluation of the threshold for reactions and for ultimate diagnosis, but has only rarely been applied in spice allergy. Also inhalation challenges with spices have been made, but are infrequent. This is possibly due to the risk for the development of severe side-effects during provocation tests and unfavourable cost assessments. When diagnosis of spice allergy has been made, absolute avoidance of the spice is recommended. This should include botanically related spices, because they contain similar proteins that with high probability will also act as allergens (see Table 2). Spices are routinely used by cooks in restaurants or private environments in an automated way, and sometimes are handled as kitchen secrets. Therefore, the person in charge of cooking must be advised in advance to prepare the foodstuff on clean dishes without the possibility of contamination with traces of spices. If severe allergic reactions have occurred in the patient before, the recommendations should be even stricter and consumptions in restaurants or of tinned or fast food can no longer be recommended, considering the today's labelling policy. Labelling of spices was for a long time insufficiently regulated, e.g. was “spice” as a category sufficient for the whole large panel of different ingredients. According to the aim that all ingredients should be labelled regardless of the quantity contained in the finished food, in 2004 a defined list of foods with allergenic potential has been taken up in the EU labelling issues. They are listed in Annex IIIa of Directive 2003/89/EC, to be brought into force by November 25, 2004. Importantly, this list includes celery, mustard and sesame seed which have a well documented allergenic potential. At least for these common spices the option to declare them as ingredients by category will no longer apply. Facing the fact that spices are hidden in foods in low amounts, the new legislation will improve the consumer's situation. However, severe allergic reactions have also been observed to a number of other spices as e.g. poppy (2), coriander, cumin, dill, curry, or saffron. Therefore, complete labelling of spice ingredients should be an ultimate goal. Spices: Synonyms and biological description. green cardamom, greater c., Nepal c.
Indonesian c., Cassia, Vietnamese c.
Annual plant: dried fruit or dried leaves. 1. Spices with reported allergenicity are underlined. 2. Spices taken up in the Annex IIIa of Directive 2003/89/EC of the European Community guidelines are underlined and bold. Table 2. The botanical relationships among important spices. Kutting & Brehler (2000)  report a case of ingestion of poppy-seed cake followed by generalized urticaria but only in combination with physical exercise. Frantzen et al. (2000)  report a patient with epigastric pain, angioedema, and respiratory distress. Jensen-Jarolim et al. (1999)  reported 11 patients with 8 OAS and 4 gastrointestinal symptoms. All 11 showed systemic symptoms with flush, rhinitis, rhinoconjunctivitis, pruritus, urticaria and eczema. One patient had cough, three wheezing and one asthma. One had anaphylaxis. Gloor et al (1995)  reported 3 patients with a severe allergic immediate-type reaction to poppy-seeds including anaphylaxis. Kalyoncu and Stalenheim (1993)  reported Quincke's oedema (swelling of lips, tongue, oropharyngeal mucosa and face with respiratory difficulties) in one patient. Vocks et al. (1993)  reported 5 poppy seed allergic patients. All reported atopic dermatitis. Two patients developed angioedema of the glottis and anaphylaxis, with one also showing asthma; one vomiting, diarrhoea, and angioedema of face; one generalised urticaria; one patient had severe asthma and developed angioedema of lips and palpebrae. Braun et al. (1988)  report a patient with swelling of the oral mucosa, vomiting, respiratory distress, and urticaria. Wagner & Ring (1981) [783 ] reported a patient with itching around the mouth and lips, nausea, and dyspnea developing into anaphylactic reactions. Kutting & Brehler (2000)  used crushed poppy seeds after suspension in a drop of physiologic saline solution. Frantzen et al. 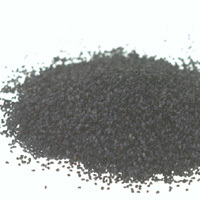 (2000)  used raw and baked poppy seeds. Jensen-Jarolim et al. (1999)  used a commercial extract. Kalyoncu and Stalenheim (1993)  used an extract of ground poopy seeds (1:10w/v). Jensen-Jarolim et al. (1999)  used histamine dihydrochloride (10 mg/mL) as a positive control. A SPT reaction was recorded as + + + when the wheal was equal to the histamine control, + + for a wheal half the positive control, + for smaller than half. 1 (Kutting & Brehler 2000) . Kutting & Brehler (2000)  report a positive prick test. Frantzen et al. (2000)  report positive prick tests with raw and baked poppy seed. There was a clinically irrelevant positive SPT to hazelnuts, walnuts, and almonds. Jensen-Jarolim et al. (1999)  reported 8/11 positive reactions (2 +, 4 ++, 2 +++). Kalyoncu and Stalenheim (1993)  report a 9x10mm reaction. Vocks et al. (1993)  reported 5/8 positive reactions (these were 5/5 with a history of poppy allergy). Jensen-Jarolim et al. (1999)  used roasted poppy seeds homogenized in a food processor and grounded in liquid nitrogen before extraction. Proteins were extracted 10% (w/v) in 10 mmol/L potassium phosphate buffer (pH 7.0) containing 2% (w/v) suspended solid polyvinylpolypyrrolidone (PVPP), 2 mmol/L ethylene diamine tetraacetic acid (EDTA), 10 mmol/L sodiumdiethyldithiocarbamate (DIECA), and 3 mmol/L sodium azide, by overnight shaking at 4°C. Vocks et al. (1993)  extracted poppy seeds (also hazelnut, rye grains, kiwi and sesame seeds) using 0.1M phosphate buffer for 2 hours at 8C, followed by ultracentrifugation, filtration and desalting. CAP (Kutting & Brehler 2000) . Kutting & Brehler (2000)  report specific IgE antibodies could be detected against poppy seed (13.4 kU/l). Frantzen et al. (2000)  report specific IgE was 1.69 IU/ml, class 2. Jensen-Jarolim et al. (1999)  report that all 11 patients were RAST positive to poppy (3.0-90.2 kU/L). Vocks et al. (1993)  found 5/5 patients showed positive RAST. Jensen-Jarolim et al. (1999)  used 1D SDS-PAGE with 12% acrylamide gels. Samples were heated at 95 degrees for 5 minutes before loading. Vocks et al. (1993)  used 1D SDS-PAGE with 7.5-20% gradient acrylamide gels with beta-mercaptoethanol. Jensen-Jarolim et al. (1999)  transferred proteins to nitrocellulose with 0.4-µm pore size. Strips were blocked in 50 mmol/L sodium phosphate buffer (pH 7.5), 0.5% (w/v) bovine serum albumin, 0.5% (v/v) Tween 20. Sera were diluted 1:4 in blocking buffer and incubated overnight at 4 °C. IgE was detected by 125I-rabbit antihuman IgE (MALT Allergie System, IBL GmbH, Hamburg, Germany). Vocks et al. (1993)  transferred proteins to nitrocellulose with 0.45-µm pore size. Strips were blocked in phosphate buffer (pH 7.4) with 0.5% (v/v) Tween 20. Sera were diluted 1:2 in blocking buffer. IgE was detected by 125I-antihuman IgE. Jensen-Jarolim et al. (1999)  found that 10/11 patients showed IgE binding to a 45-kDa protein, 4/11 to a 34-kDa, 5/11 to a 17-kDa, 5/11 to a 14-kDa, and 3/11 to a 5-kDa component. Sera from single patients bound IgE to proteins of 20, 25, 30 and 40 kDa proteins. Periodate treatment of blots markedly reduced the IgE binding capacity of the 40- and 45-kDa compounds, indicating the existence of carbohydrate type IgE epitopes. Vocks et al. (1993)  found that all 5 sera showed IgE binding to a 42 kDa poppy seed protein. All 5 sera contained IgE which bound to additional poppy proteins but no other Mr was observed with more than 3 sera. Jensen-Jarolim et al. (1999)  reported that 9/11 patients had symptoms of pollen allergy and IgE binding to the 45-kDa major allergen was inhibited by pre-absorption with extracts of birch, mugwort and timothy grass pollen. This suggests the 'celery-mugwort-spice syndrome' with cross-reactive IgE. Gloor et al (1995)  report that all 3 patients' sera was also IgE positive for sesame. Vocks et al. (1993)  reported reaction to hazelnut and positive RAST to rye grain in each of 5 poppy seed allergic patients. Preincubation of sera with poppy seed extract inhibited IgE binding to hazelnut and rye immunoblots for most sera. However, the 20 kDa band from hazelnut was not cross-reactive with poppy seed extract. Jensen-Jarolim E, Gerstmayer G, Kraft D, Scheiner O, Ebner H, Ebner C.
Serological characterization of allergens in poppy seeds. Wagner G & Ring J.
Anaphylaktische Reaktionen durch Nuß und Mohnallergie. Frantzen B, Brocker EB, Trautmann A.
Immediate-type allergy caused by poppy seed. Common allergenic structures in hazelnut, rye grain, sesame seeds, kiwi, and poppy seeds. Severe systemic reactions caused by poppy seed.